Remember Niles? (now Max). 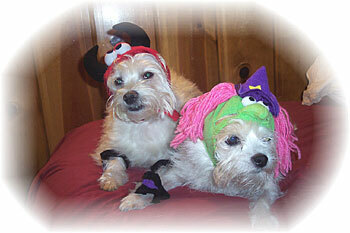 Here are some recent pictures (2 from last year's Halloween costumes) of Max (Niles) with his sister, Whizzy. Whizzy is very busy. She's Busy Whizzy. 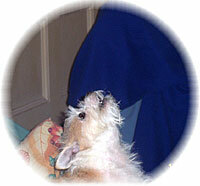 Max is a crooner and just wants to sing a little song. I call him Max Sinatra. He's not much of a barker. Instead he gets excited and does the cutest little happy foot dance and then throws his head back like a little wolf and howls. Max (Niles) adopted at 4 1/2 lbs. He is now about 9. You took such good care of him when he was so sick, scared and fragile, letting him stay in the house while you nursed him back to health. 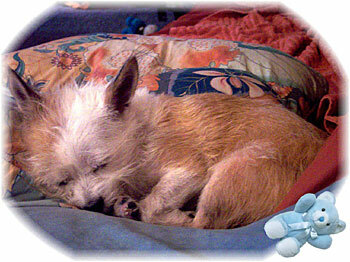 Max is one of the sweetest little dogs I've ever known and a joy to spoil. He's just darling. When I first adopted him he would roll over on his back in that submissive scared position every time anyone moved or looked at him. Now he only rolls over when he wants his tummy rubbed, which is a lot. He's extremely affectionate and so so sweet. He was also afraid to eat around other dogs. He was so little and scared. At first I had to put him on a comforter on the floor next to his bowl and take Whizzy for a walk so he could steal his own food. Now he owns his bowl! When I first got him, he was so weak he had to be carried everywhere. He's confident now and is a real stubborn little Macho man on his daily walks, which he loves. I just wanted to update you and let you know how well he's doing as the spoiled, pampered house dog he was meant to be. I wanted again to thank you for saving the life of this precious little dog. This is a very special little boy. Whizzy thanks you too. Thanks again for all your great work.